Modern businesses use different tools, systems, strategies, and protocols to improve their business performance. When innovation and efficient use of resources become the primary option for business growth, businesses are particular to grab technologies and procedures that can help them to enhance their performance. However, traditional businesses and industries have less space for technology innovation, compared to the modern service sector. The procedures and strategies they implement in their workspace make a difference for them. Line marking is a great tool for factories, warehouses, and industrial plants to improve their business performance. Do you want to know how it can add value and improve the business performance of your factory, industrial plant, or warehouse? Here is an inside look at how safety line marking protocols improve the business performance of factories and warehouses. Most industrial plants, factories, and warehouses have hundreds of employees, machines, and vehicles. Managing each of them is not an easy task, and poor management can lead to inefficient operations. Factory and warehouse line markings are drawn after considering various factors that can increase the efficiency of their workforce, machines, and systems. 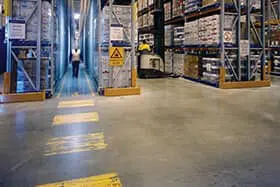 For instance, the workforce of many factories and warehouses, without proper line marking, spend more time on non-productive things to complete their tasks, such as walking or searching for products and double handling. With the shortest path for the workforce to complete various tasks and separately marked spaces for each product and raw material, factory and warehouse line marking increases the actual productive hours of the workforce. Thus, line marking reduces the wastage of both time and energy. Proper line marking at a factory or a warehouse can make a significant improvement in organisational structure as well. With defined spaces for different workforce teams, products, and equipment, businesses become more organised and better controlled. Factory and warehouse line markings also include shapes and signs to convey specific information to the workforce. Most line marking contractors in Melbourne use arrows to give direction and footprints to show the path for the workforce. Similarly, exit signs, stop signs, and warning signs can give specific messages to people. The organisational improvements can give better insights for businesses that can enable them to identify the flaws in their facilities. It also helps them to strategise better business plans to shine. Proper line markings always focus on achieving organisational goals and objectives, and that becomes a critical asset for the growth of the business. Proper line markings and anti-slip coatings in factories and warehouses improve the safety of the workforce, equipment, and products. With separate paths and proper line marking for workforce and equipment like forklifts, businesses can avoid workplace accidents. It also minimises the cross flow of traffic by the workforce, equipment, and vehicles. Do you know that Safe Work Australia, the statutory body that frames national policy on work health and safety, has stricter regulations and compensation policy for workplace accidents? It compiles and analyses work-related injuries, diseases, and fatalities that happen across Australia. The statutory body also releases four annual reports to give a comprehensive picture of the safety-related issues at workplaces. It means that workplace accidents and injuries can have severe consequences for businesses and even lead to the permanent closure of factories and warehouses. By creating a well-kept and organised environment, businesses improve the morale of the workforce and help them to take pride in their workplace. It improves the relationship among employees with reduced confusion, stress, and workplace conflicts. Proper warehouse and factory line marking and anti-slip coatings can enhance every aspect of the business. The enhanced safety ensures the minimal absence of employees due to workplace accidents. In return, it helps businesses to offer consistent services and be more competitive in the market. During emergencies, proper line marking for an exit plan can reduce fatalities in factories and warehouses. Clear and visible markings, even when there is smoke, can help employees to evacuate warehouses and factories quickly. Similarly, highly-visible markings towards fire extinguishers at the workplace can help employees to grab the extinguishers quickly. It can help businesses to reduce the loss of both life and critical assets. Seamless business services make a difference to your product and service offerings. Ensuring that there is no halt to your business operations or at least minimal disruption and maximum productivity should be your primary method for overall business improvement. With proper line markings at your warehouse or factory, you make your workplace safer for your employees. They become more organised and spend more time on productive work that can make your business grow. Some line marking companies in Melbourne can even advise you on necessary changes to make your workplace safer. It further strengthens the capabilities of your business and makes it more competitive to improve your business performance on the market. Talk to Mainliner about anti-slip walkways, line marking, and signage to help your business remain OHS compliant.